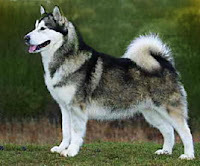 Alaskan Malamutes are large working dogs. They have been used through the years as sled dogs, but aren't naturally as fast in the long run as there blue-eyed competition (huskies). Originally bred as a sled dog they were taught to think independently which sometimes results in them being a bit stubborn. Absolutely magnificent coloration and such a beautiful and strong overall build. Highly intelligent and loyal they are certain to make a nice family pet.